International Journal of Research in Health Sciences,2015,3,2,355-360. 1,2-Assistant Professor, Department of Hospital Adminitration, ACSR Government Medical College, Nellore, 3-Post Graduate, Department of Obstetrics and Gynecology Kurnool Medical College, Kurnool, Department of Obstetrics and Gynecology, Government Medical College, Ananthapur, A.P., INDIA. 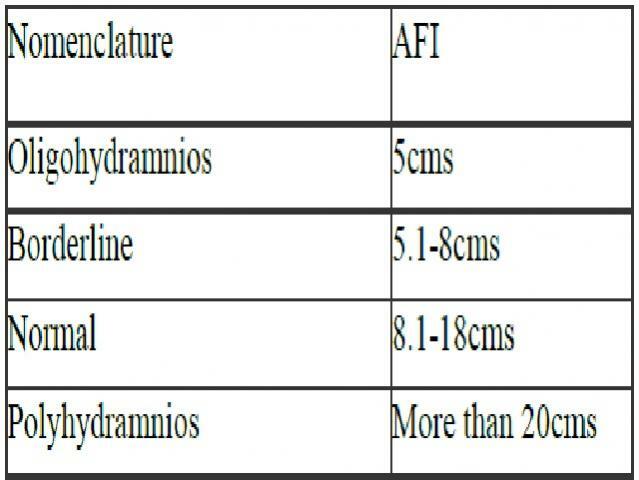 Oligohydramnios is defined as decrease in the amount of amniotic fluid in relation to the gestational age. This study was conducted in the department of obstetrics and gynecology, Government general hospital, Kurnool from March 2013-april 2014. This is a prospective case control study of the antenatal women who are admitted in labour room/ antenatal ward.